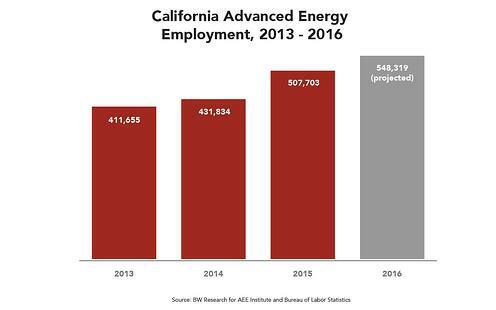 [SAN FRANCISCO, April 13, 2016] – Employment in California’s advanced energy industry grew 18 percent last year, six times the rate of statewide employment growth. More than half a million California workers spend some or all of their time on advanced energy work, including energy efficiency, advanced electricity generation, biofuels, advanced grid technology, and advanced vehicles. Employers engaged in advanced energy business also expect to increase their workforce by 8 percent this year. The AEE Institute survey of more than 800 businesses doing business in California is the second study of advanced energy employment in the state conducted by BW Research Partnership, a leading workforce and economic development research firm. The first survey, published in December 2014, found 431,000 advanced energy workers in California, with employers predicting they would add workers at a 17 percent rate in the coming year, bringing the total to more than 500,000 – a prediction that came true, according to the new survey, which asked businesses about employment levels in 2015. Advanced energy employed an estimated 508,000 Californians in 2015 – an increase of 18 percent over 2014, which is six times the rate of overall state job growth of 3 percent. Workers engaged in advanced energy make up 3 percent of the state workforce overall, up from 2.5 percent in 2014. Employers surveyed expect to add jobs at an 8 percent rate this year, which would bring advanced energy employment to nearly 550,000. By far the largest share of advanced energy jobs is in energy efficiency – 63 percent, or roughly 320,000 workers. But this share is down from 74 percent in 2014, as some smaller segments of advanced energy employment have grown faster. Employment grew fastest in the Advanced Grid segment, which includes smart grid, storage, and electric vehicle charging technologies. The Advanced Grid workforce more than doubled between 2014 and 2015, adding over 11,000 new jobs. The greatest increase in number of jobs came in Advanced Generation, with solar accounting for nearly 80 percent of jobs in this segment. Advanced Generation employment grew 50 percent over 2014, creating almost 48,000 new jobs in the state. Advanced Transportation, which includes hybrid, electric, and natural gas vehicles, also saw impressive growth, adding just under 7,000 new workers to payrolls, 65 percent more than in 2014. The only advanced energy segment that lost jobs was Advanced Fuels, including biofuels and biomass, which were both impacted by low oil and gasoline prices. Advanced Fuel employment fell more than 50 percent last year, resulting in a loss of about 8,000 jobs. California’s advanced energy workforce is quite diverse. Although predominantly male (74 percent), advanced energy workers are 38 percent racial or ethnic minorities, with the minority share of last year’s hires slightly higher (39 percent). California has nearly 43,000 companies engaged in advanced energy as part or all of their business activity. California’s advanced energy industry is primarily composed of small businesses, but there is a shift toward larger establishments as the industry matures. Three-quarters of advanced energy businesses employ 24 permanent employees or less, but that is down from 81 percent last year. Firms that employ between 25 and 49 employees have grown from 6 percent of the industry in 2014 to 9 percent in 2015. The share of medium to large firms (those that employ between 25 to 249 workers) has also grown, from 13 percent to 22 percent. These companies are increasingly relying on advanced energy business as their primary source of revenue. In 2014, four in 10 firms derived all of their revenue from advanced energy activity; this has increased to almost half of the state’s advanced energy firms today. Advanced Energy Economy (AEE) is a national association of businesses that are making the energy we use secure, clean, and affordable. AEE’s mission is to transform public policy to enable the rapid growth of advanced energy companies. The Advanced Energy Economy Institute is a nonprofit educational and charitable organization whose mission is to raise awareness of the public benefits and opportunities of advanced energy. 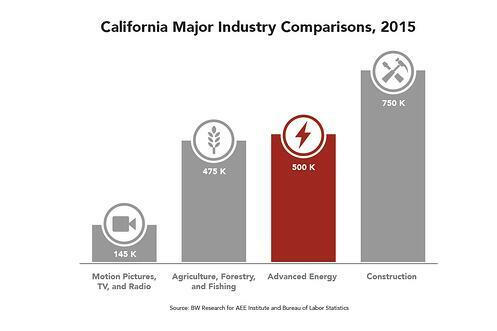 Advanced Energy Jobs in California report is here. Advanced Energy Now 2016 Market Report (U.S., global revenue) is here. This is Advanced Energy, directory of 52 technologies, is here.